Transpersonal psychology is the study of human nature and proceeds on the assumption that human beings possess potentials that exceed the limits of their ego and integrate the spiritual experience within a broader understanding of the human psyche and consciousness. Altered states of consciousness have been used as psychotherapy in transpersonal psychology for decades. A Cyberpsychotherapy system is proposed to support transpersonal psychotherapy. The system can be used to induce non-ordinary state of consciousness that can be used by transpersonal psychologists as a healing tool to cure his patients with psychological problems such as psychosis at a distance location with the help of Internet technologies. The Cyberpsychotherapy system uses quantum signal generator for the induction of altered states of consciousness based on the God's helmet of Persinger (1983). The Cyberpsychotherapy has integrated an EEG that serves as a biofeedback device in order to assess if the patient has reached the desired level of consciousness and can be used it to adjust the frequencies of the signal generator in order to improve the psychotherapy experience of the patient if necessary. A sample of 10 patients was used to test the Cybertherapy system based on Neurotechnology and quantum biofeedback, data was collected and analyzed. Although the results show that the patients were not able to reach the desired level of consciousness for the psychotherapy, there is statistical significant evidence that the proposed system can help to raise the level of consciousness; this can help with future designs that will eventually assist to reach the desired level for the psychotherapy. 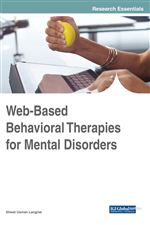 Cybertherapy is an Internet based computer-mediated system used to facilitate psychotherapy (Botella et al. 2009). This includes new applications of technology within psychology and healthcare, which utilize augmented and virtual reality components in order to facilitate psychotherapy (Botella et al. 2009). Although there are many Cybertherapy systems in the literature (Takacs, 2005), none of them addresses transpersonal psychotherapy and are based on quantum biofeedback. Transpersonal psychotherapy that is based on transpersonal psychology, considers that the psyche is multidimensional and there are several “levels of consciousness” and each has different characteristics and is governed by different laws. Transpersonal psychology is the study of human nature and development proceeds on the assumption that human beings possess potentials that exceed the limits of ego developed normally. A main goal of transpersonal theory is to integrate the spiritual experience within a broader understanding of the human psyche and consciousness (Grof, 1988). The trend to explain consciousness by applying quantum theories has gained popularity in recent years and, although clearly disdained by neuroscientists, more and more researchers direct their steps this way up. Brian D. Josephson (1962) of the University of Cambridge, winner of the 1973 Nobel Prize in Physics for his studies on the quantum effects in superconductors (Josephson effect), proposes a unified field theory, quantum nature, that would explain not only the consciousness and its attributes, but also all the phenomenology observed to date in terms of psychological and mystical experiences. The human being experiences different altered states of consciousness, that is, consciousness can be altered in different ways. Stanley Kripner (2000) defines altered states of consciousness as mental states that can be subjectively recognized by an individual or by an objective observer than the individual who experiences it as different in mental functions, the normal state of the individual, the alertness and the waking. Altered states of consciousness have been used as psychotherapy in transpersonal psychology. One of these techniques is known as holotropic breath work that is produced by using hyperventilation making the individual breathing deeply and rapidly for several minutes. Grof (1988), with this technique, causes a crisis that leads to an altered state of consciousness and allows the study the consciousness of the individual from that new state. Stanislav Grof (1988) uses the experiential healing power of this new state of consciousness to cure his patients. Although holotropic breath work induces these altered states of consciousness, biofeedback and neurotechnology offer an alternative way to induce altered state of consciousness for transpersonal therapy that can be easily implemented with the use of quantum computer technology and used in combination with the internet to facilitate online transpersonal therapy (Valverde 2015a). Quantum biofeedback uses sensors to monitor physiological relaxation indicators, as the temperature of the skin and muscle tension. It expands classical biofeedback by using galvanic skin response (GSR) together with modern computer technology to detect the response of the built-mind-spirit body (sometimes called the super-conscious) to a large array of stress indicators. Quantum Biofeedback is a sophisticated biofeedback technique based on advanced quantum scientific principles that promote a deeper understanding of health and healing. Seeing the body as a complex electrical circuit and the application of the principles of electrical engineering, who are able to analyze and balance the body electric.